AV: Music was pretty much a part of your life from a very early age. What was there about music that fascinated you and attracted you to it so powerfully? DA: The first music I remember being aware of is the Nutcracker. It was filled with imagery, especially from faraway lands, which has become a theme of mine. Then as I listened closer, I think it was the emotional content of music that got to me. The fact that it could make you feel a certain way. I knew as a kid what I wanted to do. AV: Did your move from rural Chicago to California as a 10 year old affect you in regards to your interest in music and how that would eventually be expressed in your own compositions? DA: Well, it exposed me to surf music, which was so cool! I started to think about being in a band and what that meant. Way different than a baseball team, which was the group I usually belonged to. I thinkCalifornia was more 'fun' for me than the midwest. The ocean, mountains and such. I think my love of nature which runs through a lot of my music started incubating. AV: As a teen in high school and then on into college you did a lot of playing in groups and traveling around with bands, tell me about that time of your life and how it helped to mature your musical sensibilities to the point that you were able to finally settle down with some idea as to what you wanted to do with your own sound. DA: I did a lot of experimentation with convoluting other artists' songs I liked. That started me discovering elements I thought I'd like to hear in my own music. When I started writing my own songs for my bands, these discoveries took flight and became the first examples of what I'd call my 'style.' I think playing other people's music helps you get a sense of song structure and basic characteristics of music making. After a little of that, I started my own bands and rehearsed and played a lot. I think some more of my style was born during this time. I think it just evolved naturally over time into what I do now. I had always had songs that were more like what I do now, that didn't seem to fit in my rock bands. AV: When was it that you first encountered the music that was being called new age music and what were your first impressions of this style of music? DA: I think my first contact with new age was Kitaro and Steve Halpern. I identified more with Kitaro, it reminded me of Pink Floyd without the vocals. I thought I might be able to bring something interesting to that kind of music. Most of it was like sparse, acoustic meditation recordings. I never really considered myself new age until I hooked up with Narada. AV: Why was it that when technology reached a certain level you knew that you would be able to give voice to the music that you had only imagined to that point in time? DA: The limits of having only two hands were gone when computers and synths started to speak to each other. The possibilities were now endless and limited only by my imagination. Which luckily was abundant. Plus, I always wanted to play all the parts myself! When this electronic communication began, I knew I would be able to do more extensive orchestrations on my own, and hear more of what was in my head, and just experiment easier with sounds and emotional stimulation. AV: Tell me about some of your early compositions that were the first glimmers of the style that would eventually become very recognizable as David Arkenstone music. DA: One of my first songs, 'Lady of the Sea,' was reminiscent of Celtic ballads, which I later wove successfully into my style. Another song named after a local real estate guy, 'Mo Bortz,' was an uptempo shuffle, again in the Celtic vein, which I continue to use fragments of to this day. AV: When did you start to shop your music around looking for a record label to release it to the public and where did you finally end up for that first release? Was the whole process pretty much what you had expected it to be before you started? DA: I ended my rock band in 1985 after unsuccessful attempts at recording deals. We got very close, but it just didn't happen. We were playing music of epic proportions in a sea of skinny tie music. So I concentrated on my own thing and started to send demos out toward the end of that year. It was refreshing to receive several call backs after so much bad luck in bands. I chose Narada as the best place for me at the time and we started reviewing all the material I had amassed . . .
AV: What kind of feedback did you receive from that first release and how did you feel about having your music out there in the world? DA: Valley in the Clouds was received exceptionally well in the new age area, which was extremely gratifying. I felt it was a long time coming, and I was on my way....little did I know I had to work just as hard on every recording! AV: What do you like to work with as far as compositions in process goes, electronics or traditional instruments? DA: I use anything and everything. Sometimes I'll just be playing around with guitar riffs and textures, or I'll start with drum loops and play drums against them, sometimes it's sounds I trigger from my keyboard that gets me going. I'm always searching for a new way to string notes together, or textures I haven't heard before. AV: Do you have an overarching theme to each of your musical projects in process and how do you keep the music flowing towards a unifying theme during the time you spend writing the music? DA: I feel I work better and more focused when I have a theme. Sometimes, as with Atlantis, I'll actually plot out the different parts of the story I want to illustrate. Of course, it always changes and evolves, but it gets me going toward the goal. It also keeps from straying to far outside the story, which brings some cohesion to what I'm trying to say. AV: How has technology and software changed your process flow as a musician and a composer over the years since you refined the sound that defines your music? DA: Well, there are always new sounds to use and the software keeps evolving and I try to keep up with it! It's definitely much easier to achieve a wonderful sounding piece in a much shorter time. A complete musical thought is easier to realize than ever before. 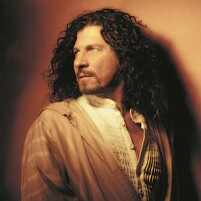 AV: What would you say was the first CD that you put out that really made you feel like this is the sound that I have been looking for all these years and that really defines what David Arkenstone's music is all about? DA: Very difficult to say, as I feel I'm always evolving between each recording. I'm probably most proud of 'Atlantis' in that regard to your question, though I hear improvements on all the other recordings, too. But I'm usually happiest with my most recent CD! AV: What was it that you wanted to accomplish with the Troika series of releases over the years? DA: I had written a lot of material that wouldn't necessarily fit my regular cd's. Narada thought it would still be good to get that music out there, too. So with some friends, we recorded that stuff and put it out. It's kind of like another side of me. AV: How has the internet changed the way you relate to your fans and how you market your music to the world? Is the internet a dream come true for niche genres such as ambient, new age, world music to find fans in ways that were not even imagined a few decades ago? DA: Due to the internet, I certainly get quicker and more detailed feedback when I release a recording. I can also communicate with my fans in a more direct way. I think the internet is fantastic for niche genres like mine, it's truly global. I have orders for my recordings that never would have happened a few years ago. AV: On your website you say that the term Cinematic new age rock is a description you can live with in regards to the music that you create. What kind of music does this term bring to your mind in regards to what you create and are there others who have been an inspiration for you along this path? DA: That term is real to me because my music has all those elements. I am definitely inspired by the great film composers. Also, the younger ones are mixing genres and using rhythms, drum loops and all kinds of sounds to achieve their sound. I do the same thing with my palette, so much variety is available to the modern composer. AV: How has the market been for new age music in the years since you put out your first CD? I've noticed that many of the first new age labels have moved a little more into jazz as of late, is this a way to diversify their sounds and gain a little more of the market that is out there? DA: New age has definitely suffered at radio since smooth jazz came along. I have opinions about this so watch out! To me, most of the smooth jazz music out there is too generic. I think it's designed as background music for work or at home. I don't believe it captures people's imaginations enough to go seek out and buy the music. But it definitely serves a purpose. But I also think that it shouldn't dominate airwaves instead of more stimulating, adventurous music. Like mine! Luckily, we have satellite radio now, which is exposing a lot of folks to new and forgotten music. AV: Tell me about your latest release, Caribbean Dreams. The title alone sounds quite different for a David Arkenstone CD so I'm curious as to where you are headed with this one. DA: Well, my second recording was entitled 'Island' so it's not too much of a stretch. I love the ocean and coastal cultures so much it's just a strong inspiration for me. AV: Does it help to have your ex-wife involved in music along with yourself? Do the two of you work off of each other's creativity when it comes to creating your solo work? DA: A lot of our solo stuff is just that, though it's good to have a sounding board sometimes. AV: It seems that between the two of you there have been numerous releases over past few years. Tell me about the Neo Pacifica label and the Adventure Cargo series of releases. Are each of these groupings designed to allow for the expression of separate musical journeys? DA: We started Neo Pacifica as a way to branch out into many different things. We had a lot of ideas for separate musical journeys. We bring in different musicians for each project depending on the style. There is a great freedom is owning your own label, as well as lot more work! AV: What are your feelings on the state of MP3's and digital sales of your music as we move along the technological highway? Are you still doing most of your sales in the traditional CD format? DA: Though most of my sales is still CD's, digital sales will start taking over just as CD's surpassed records and tapes. As the players become more sophisticated, this will be the preferred format. With video, and unlimited text and pictures, the music will benefit and become more a part of the listener's world. AV: So what other areas of music do you want to explore in the coming years and are your fans in for some surprises with future releases? DA: I am definitely trying to break further in to doing music for film and tv. It's so exciting being part of a team attempting to bring about an interesting story. I also have several release I'm working on: Myths and Legends, Heart of the Flute, Star Windows, Spirit of the Drum. AV: Do you take your music out on the road on a regular basis and is it difficult for your to recreate your sound live? DA: I love to play live, always have since the very beginning. While some of music is impossible to perform live, there is a lot that was designed with that in mind. So it comes down to choosing songs I feel can best benefit from the live atmosphere and the particular musicians I'm working with. AV: Finally, after heading down this road for almost 20 years now what have you learned about your music, about the industry and about yourself? And are you happy with where you are now in relation to where you started? DA: Every day I wake up and think how lucky I am that I can do what I want in life. My music is constantly evolving as I am as a human being. It is the strongest force in my life. Every day is like an adventure. I never know what path I'll take. Hopefully, as long as I please myself, others will join me on this musical journey. There is still a lot I want to explore, but I'm happy and hopeful for the future. AV: Thanks so much for taking the time to talk to me and share your journey with the readers of Ambient Visions and thanks for creating part of the soundtrack of my own journey. Best of luck in everything you set your mind to.